Definition at line 1003 of file lscript_tree.h. Definition at line 1006 of file lscript_tree.h. Definition at line 1011 of file lscript_tree.h. 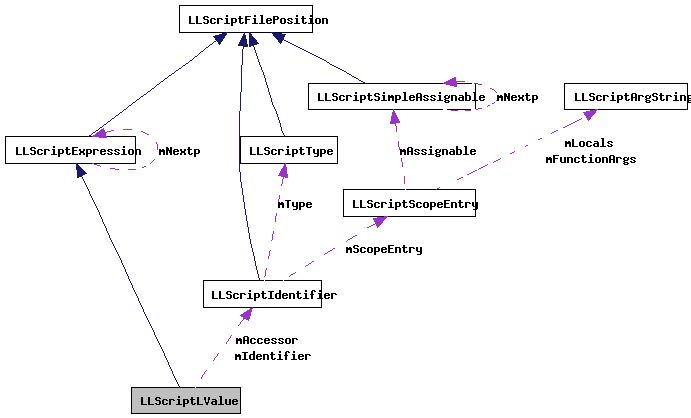 Definition at line 4134 of file lscript_tree.cpp. Definition at line 3854 of file lscript_tree.cpp. References LLScriptByteCodeChunk::addByte(), LLScriptByteCodeChunk::addInteger(), FALSE, LLScriptScope::findEntry(), gErrorToText, LLScriptGenerateErrorText::getErrors(), LLScriptExpression::gonext(), is_parameter(), LIT_GLOBAL, LIT_VARIABLE, LOPC_PUSH, LOPC_PUSHG, LOPC_PUSHGL, LOPC_PUSHGQ, LOPC_PUSHGS, LOPC_PUSHGV, LOPC_PUSHL, LOPC_PUSHQ, LOPC_PUSHS, LOPC_PUSHV, LSCP_EMIT_ASSEMBLY, LSCP_EMIT_CIL_ASSEMBLY, LSCP_PRETTY_PRINT, LSCP_SCOPE_PASS1, LSCP_TO_STACK, LSCP_TYPE, LSCRIPTOpCodes, LSCRIPTTypeGlobalPush, LSCRIPTTypeLocalPush, LSERROR_UNDEFINED_NAME, LSERROR_VECTOR_METHOD_ERROR, LST_FLOATINGPOINT, LST_INTEGER, LST_KEY, LST_LIST, LST_QUATERNION, LST_STRING, LST_UNDEFINED, LST_VECTOR, mAccessor, mIdentifier, LLScriptScopeEntry::mIDType, LLScriptIdentifier::mName, mOffset, LLScriptScopeEntry::mOffset, LLScriptExpression::mReturnType, LLScriptIdentifier::mScopeEntry, LLScriptScopeEntry::mType, NULL, print_cil_accessor(), print_cil_load_address(), print_cil_member(), LLScriptIdentifier::recurse(), S32, TRUE, and LLScriptGenerateErrorText::writeError(). Definition at line 1020 of file lscript_tree.h. Referenced by print_asignment(), print_cil_accessor(), print_cil_asignment(), print_cil_load_address(), and recurse(). Definition at line 1019 of file lscript_tree.h. Referenced by print_asignment(), print_cil_accessor(), print_cil_asignment(), print_cil_load_address(), recurse(), and store2stack(). Definition at line 1018 of file lscript_tree.h. Referenced by print_asignment(), recurse(), and store2stack().